It’s a companion to a Special Interest Keynote titled “How Patient/Provider Engagement Can Transform Healthcare,” which my primary physician Dr. Danny Sands and I will deliver December 7 at the Institute for Healthcare Improvement (IHI) Forum in Orlando. It’s my cancer story as seen from our two perspectives, as physician and patient, in the age of the internet. Earlier versions of the talk have been titled “Illness in the Age of ‘e’,” but this event calls for a change – because participatory medicine is now a full-blown movement, with its own medical society, with its Journal of Participatory Medicine as well as the e-patient blog. Plus, significantly, patient and family engagement is now part of Federal policy – it’s one of the “meaningful use” requirements for providers to earn financial incentives in the coming years. Clearly, the age of participatory medicine – of patient/provider engagement – has arrived. An early ally of the movement was Susan Carr, editor of PSQH. The patient safety movement clearly sees the value of patients and families being actively engaged in all aspects of care, so we talked this summer about how we really ought to do something together. Then we realized, the subject of our IHI keynote applies perfectly to patient safety, an important part of healthcare. The result was an article, in the November-December issue of the magazine. 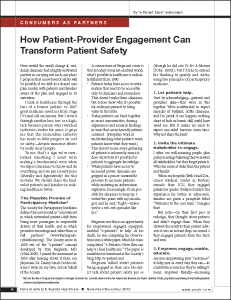 (This is the issue that will be distributed at the IHI Forum.) Susan gave permission to post it early, before it arrives in the mail. Click to open the PDF (765k). And remember: “patient” is a collective noun. Often, the person who’s engaged in managing a patient’s care is the parent or adult child of the one receiving care. Call us patients, caregivers, consumers, whatever – we’re the ones who gain or lose the most from the outcome, and we’re the ones who are on the case 24/7. We want providers to recognize our value and let us help. Thanks to everyone in the safety and quality movement for their partnership, and especially to Susan and PSQH for the vision to move forward with this project. The IHI Forum’s website is here, and the full Forum brochure (PDF) is here. Actually this the work that has been going on for years. There are literally hundreds of people and organizations working on patient safety all across the country and patient centered care has been part of the IOM goals for over a decade. There has been legislation passed and people working at the local and national level as well.. It wasn’t clear if you participated in the ICU design you mentioned? Was that the result of anything you were involved in? Some great resources include National Patient Safety Foundation is a not-for-profit organization founded in 1996 by the American Medical Association, th NPSF provides leadership training, research support, and education. As you article points out most hospitals include patients on patient safety committees as well. Did you serve on one yet? Safe table exercises are really interesting for patients to participate in. CAPS is also a great example – CAPS has an new initiative titled Add Patients, Change Everything! in July 2008. CAPS sought local partners to convene groups of proactive consumers who care about patient safety and other stakeholders who wish to work with patients for workshops to be held in three US cities/metro areas or regions in the United States in 2008-09. Participatory medicine isn’t new though it is being marketed that way in the past year or so. Kaiser for example was founded by consumers over 70 years ago and patients own the health care system and participate in all aspects of it..
Hi Levin! Thanks for this contribution. No, I wasn’t involved in the ICU redesign. I’m very new to all this – it’s only been in the past 20-24 months. I’m not “claiming credit” for any achievements – just pointing out something that most people I know have said is a worthy objective, and not at all a reality in most places. Yes, I’m very aware of the precedents. I didn’t mean to suggest that this was a new idea, and certainly not mine. Others (not I) started the Society 20 months ago, noting that the approach didn’t have any formality to it. I’ve always presumed that’s the reason why such a robust list joined the society’s board. Similarly, there’s precious little literature on the participatory approach; hence the roster of the editorial board of the Journal of Participatory Medicine. If you can provide links to existing literature I’ll be thrilled to share them! Sherry Reynolds (Twitter: @Cascadia) pointed out to me, after the article went to press, that Group Health in Seattle has had shared care plans for ages. I love it. Let’s spread the word and get EVERYONE to do it – the achievements of the leaders need to be more widely known. I appreciate looking at your site. Thank you so much!